You will be collected from your Adelaide accommodation and transferred to Adelaide Airport for your flight to Port Lincol n.
Upon arrival in Port Lincoln, you’ll be collected and transferred to your accommodation for the next 2 nights. The rest of the day is at your leisure to explore the town. Depending on your arrival time, you may like to cage dive with Great White Sharks, swim with the tuna,go fishing, visit the Maritime museum or take a walk around the town. You will be collected from your accommodation this morning, at 8.30am, to begin your 11 days of private touring through the Eyre Peninsula, along the Nullarbor and through Southern WA, to Perth. We head south and join the 14km unsealed track of the “Whalers Way”, along one of the most spectacular stretches of coastline in SA, which takes us to the very tip of Eyre Peninsula. The coast is inundated with a series of natural crevasses, giant fissures in the rocky coastline which have created deep bays, chasms and caves into which the sea surges back and forth. The Caves and old Whalers’ Grotto is a unique and beautiful series of sea caves and overhangs, featuring staligmites and staligtites. Cape Wiles is a 100 metre high cliff face above the swirling sea, with pillars of rock and an island offering continuing resistance to the Southern Ocean. Fur seals can often be seen here. We have lunch and spend the afternoon exploring Lincoln National Park. As well as a range of walks we can take along the coastline, the coast is home to the bottlenose and common dolphin, Australian sea-lions and New Zealand fur- seals. Departing Port Lincoln, we now head along the Flinders Hwy on the west coast of the Eyre Peninsula. O ur first stop along this stunning ocean drive is at the Leo Cummings monument lookout, for views of Point Drummond and the cliffs of Sheringa. The craggy pinnacle opposite the lookout is home to a family of osprey. We drive through the old pioneer town of Colton and past Lake Newland Conservation park to Talia Beach and Talia Caves. The Woolshed is a large cavern carved into the granite cliffs and is accessed by a walkway and wooden steps. The cave has a honeycombed ceiling and dark crevices with blowholes nearby. We also explore The Tub and enjoy the dramatic views to the south of the beach. Turning off the main highway, we stop at Murphys Haystacks. Made up of pink Hiltaba granite, the haystacks have stood on top of the earth in their present form for nearly 34,000 years. 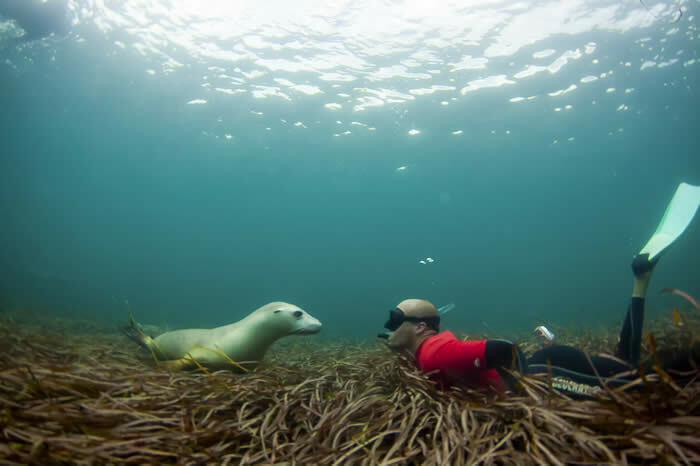 You have a very special eco- experience this morning as you can swim with sea-lions and dolphins at Baird Bay. Unfed, untrained and totally wild, the sea-lions and bottlenose dolphins will choose to interact with you on their own terms. The gentlest of underwater mammals, sea lions love to play and you will definitely experience the joy they get from swimming with you – and you with them ! The tour lasts approximately 4 hour including a total of 30 mins travel time on the boat. Then onto nearby Point Labatt, where a high cliff top lookout allows us to view a sea-lion colony 50m below. The colony at Point Labatt is the only permanent breeding colony on the mainland as all other colonies occur on the offshore islands. After lunch, we continue north to Ceduna, the major regional business centre of the Far West Coast of Eyre Peninsula. You have a couple of hours free in Ceduna this morning. Perhaps look around the Ceduna Aboriginal Arts & Culture Centre, walk the Encounter Coastal Trail, take a walk to the jetty or play a couple of rounds of gold on the worlds longest golf course, starting in Ceduna and finishing in Kalgoorlie - 1,365 kms away ! There is one hole in each participating town or roadhouse along the way. We continue west today, along the Eyre Highway, through Penong, with dozens of windmills scattered around the town. We’re now travelling along the Nullarbor Plain, the world's largest semi-arid karst (cave) landscape. Most of the park's landscape is flat except where the surface has collapsed into sinkholes revealing large underground caverns. This morning we reach the Great Australian Bight National Marine Park (the GAB), linking the Indian and Pacific oceans. The Head of Bight is a significant breeding and calving area for the endangered Southern Right Whale. The vulnerable Australian sea lion also breed in colonies at the base of the Bunda Cliffs, and are the only mainland breeding colonies in Australia. Unique marine plants, animals, and sediments found nowhere else in the world are present in the Marine Park. We stop for a photo at the unique highway sign- “look out for camels, wombats and kangaroos”, as well as the Dog Fence, the longest fence in the world, at 5300km’s, stretching across 3 states. At the Head of Bight, we stop to view the sheer Bunda Cliffs, where Australia dramatically drops into the ocean. The Bunda Cliffs are a magnificent sight in themselves and stretch in an unbroken line for 200 kilometres to the Western Australian border. We leave the bitumen behind at the Nullarbor Hotel for a drive to nearby Murrawinjinnie caves – a group of three caves, one of which includes some quite distinctive Aboriginal art. Joining the unsealed old Eyre Highway, we drive to the ruins of Koonalda Homestead, one of a number of important way stations along the old road, years ago, providing a rare piece of civilisation, fuel and emergency services. After a look around the ruins, we drive north to Heritage listed Koonalda Cave, a huge sinkhole with a cave and underground stream system at the bottom. The site was important to the local Aboriginal people and much evidence of their visitation has been found. After viewing the cave from the top, we drive south again and re-join the main highway. After a couple more stops at lookouts, we cross the border into Western Australia, put our watches back and continue to Eucla, the largest settlement on the Nullarbor Plain. We start today at the ruins of the Eucla telegraph station, which is being swallowed up by the Delisser sand dunes. Back on the road again and we pass through Mundrabilla and Madura, stopping en-route at the Madura Pass Lookout, for sweeping views of Madura Pass and the Roe Plains. We pass through Caiguna and enter the longest straight stretch of road i n Australia, which is 146.6km. Just outside Caiguna, we stop at the Blowhole, formed by chemical and physical weathering processes that erode the limestone bedrock common in this part of Australia. The name blow hole refers to the fact that these natural features breathe air in and out as high and low pressure weather systems pass across the Nullarbor. Our destination this afternoon is Balladonia, a thriving and prosperous wool producing area which made worldwide headlines in 1979 when fiery pieces of a wayward NASA space station called Skylab, landed around the grounds of the hotel ! The hotel museum houses documents from NASA, a recreation of actual events, photos and related ephemera as well as information on Balladonia's early pioneering days, Aboriginal heritage and the construction of the Eyre Highway. This morning we leave the Eyre Highway and make our way south on the unsealed Parmango Road, to Cape Le Grand, one of WA’s best known and most spectacular National Parks. The scenery ranges from wild coast al scenery, stunning beaches and rugged granite peaks to sweeping heathlands, which are home to a range of animals and flowers. Our first stop is the beautiful Le Grand Beach and then we move onto Thistle Cove, a beautiful bay with a spectacular coastal outlook and a ‘whistling’ rock, and you can take an easy walk along the coast to Lucky Bay. Keep an eye out for dolphins as you look out over the Recherche Archipelago islands. Lucky Bay is famed as having one of the most beautiful beaches in Australia. Here we can swim and snorkel or take a walk. Keep an eye out for kangaroos on the beach ! Late afternoon we drive onto Esperance and make our way to our accommodation. This morning we take the Esperance Great Ocean Drive, which is a 38km scenic drive following the coastline and including highlights such as Rotary Lookout, Twilight Beach, Observatory Point, the Wind Farm and Pink Lake. Then we drive to Albany which will take the rest of the day. The King George Sound at Albany was the site of WA’s first European settlement and on the foreshore is a full scale replica of the Brig Amity, which brought the first settlers and convicts into Albany in 1826. We head further west today, driving to Denmark and a little later we come to a beautiful beach called Greens Pool, at the eastern end of William Bay National Park. Almost completely sheltered from the waves of the Great Southern Ocean by the rounded rock boulders typical to this area, Greens Pool is paradise. From the car park we can also take a 10 minute walk to Elephant Rocks, which look exactly like a herd of elephants, paddling in the shallow waters. Further along the coastal drive is the tree-cloaked Walpole-Nornalup National Park, home to tingle forests, which occur nowhere else in the world. Here we take The Valley of the Giants – Tree Top Walk, featuring a stunning walkway positioned 40 metres above the ground amid the dizzying heights of the tingle forest canopy. Experience walking in the Tree Top canopies of tall karri trees with views over core wilderness and then venture to the Ancient Empire of 400 year old red tingle trees along a boardwalk that meanders across the forest floor. The trail follows the story of the lost era of Gondwana. Our next stop is inland, to Pemberton, the closest town to the Gloucester National Park, home of the Gloucester Tree. Today starts with a visit to the Gloucester Tree, which is one of only 3 remaining tall Karri trees that were made into lookouts during the 1930’s and 1940’s. This was a way of spotting fires in the tall Karri forest and this tree was named after the then Governor-General of Australia, His Royal Highness the Duke of Gloucester, who was visiting Pemberton at the time. Today, visitors can climb up the 61m to see one of the most spectacular views of the Karri forest. We finish the day in the Margaret River region at Augusta, founded in 1830 as the 3rd European settlement in WA and one we’ve checked into our accommodation, there’s time for a look around Margaret River. 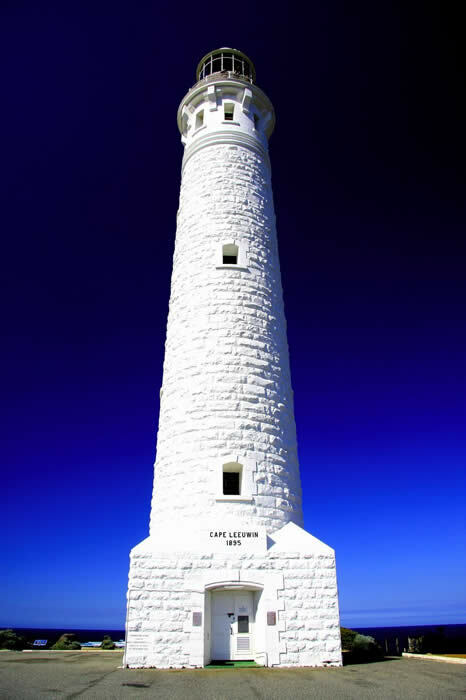 We start today at Cape Leeuwin, where the Southern and Indian Oceans meet, stands mainland Australia’s tallest lighthouse. Built in 1896, it’s still in operation today and nearby is the Old Waterwheel, a wooden water wheel that once supplied water to the lighthouse from a fresh water spring in the Leeuwin-Naturaliste Ridge. The water wheel has now calcified from the lime in the water, and although the wheel no longer turns, water still trickles over the structure, as fresh as the day the water wheel was first erected. The Margaret River region offers visitors some of the most unique and stunning cave experiences in Australia. Along the spine of the Leeuwin Naturaliste Ridge and beneath soaring karri forest lie more than 150 caves and this morning we tour the Jewel Cave, home to a frozen waterfall and one of the worlds longest straw stalactities. Be stunned by the dazzling visual display of nature at its finest and admire creations that have taken thousands and thousands of years to mould. We start slowly heading north again now and after spending some time exploring Margaret River, we start our journey back to Perth, arriving at approximately 6.30pm. You will be dropped off at your hotel accommodation. This tour is operated as a private tour only (sole use of tour vehicle and driver guide) and can depart on any day, subject to availability and weather and road conditions, between November and March inclusive. The itinerary can be amended to suit your requirements, so please contact us for more information or a quote. In November 2016 u travelled from Perth to Port Lincoln on a 9 day Nullarbor tour with Sacred Earth. It was a fantastic experience. Our driver and guide shared a wealth of knowledge covering a large range of topics about the areas we went through and as an extra treat would detour off the itinerary for guest requests. I would recommend Sacred Earth Tours to anyone who is looking for a great tour, great experience and great fun.